They used to be called northern squawfish and are now known as northern pikeminnow, but whatever you call them, these fish are destructive. They consume baby salmon along the Columbia River from The Dalles Dam in Oregon to the Pacific Ocean. Northern pikeminnow are notorious because they have voracious appetites for juvenile salmon and do not discriminate among species of fish, including endangered species. Several species of salmon in the Columbia River Basin are listed as endangered or threatened. As of July 11, any angler who catches a tagged northern pikeminnow will receive a $1,000 reward from the Bonneville Power Administration, a federal government agency that has been funding a reward program for the past several years. Previously, the reward for a tagged pikeminnow was just $50. Bonneville Power Administration (BPA) has upped the ante on the 2001 sport-reward fishing program as one of several efforts it is making to help endangered salmon survive in a year when water releases from behind BPA hydroelectric dams cannot be fully implemented because of power emergencies. "Experience has shown us that increasing the reward increases the catch," said John Skidmore, BPA's manager for the reward program. "We're hoping that the increased incentives in 2001 will mean between 10,000 and 20,000 more northern pikeminnow are caught. This could mean saving the lives of a substantial number of salmon smolts, possibly as many as a million," he said. Development of the Bonneville Power system of hydroelectric dams on the Columbia has made young salmon more vulnerable to predators, including northern pikeminnow, by slowing the flow of the river and concentrating young salmon at dams. In addition, young salmon pass dams through conduits around dam turbines, over spillways, or through the turbines. This unnatural journey disorients and injures them, making them easy prey for northern pikeminnow. 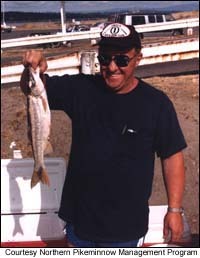 A native of the Columbia River system, the northern pikeminnow is a large member of the minnow family. It is not the same as the threatened Colorado pikeminnow, but is instead a distinct species. Each year, hundreds of anglers catch thousands of northern pikeminnow nine inches or longer. The size limitation is designed to control but not eradicate the species. Last year's catch was more than 190,000 fish. "There's a reason for the tagged fish reward besides being a large incentive to increase catch," Skidmore said. "The tagged fish are only in the mainstream of the Columbia, which is where the predators do their damage. We want to ensure anglers fish there." The fishing sites extend from the mouth of the Columbia up to Priest Rapids Dam on the Columbia River and up to Hells Canyon Dam on the Snake River. The current season ends Sept. 30. Anglers who catch pikeminnow without tags will also receive a larger reward from now on. For the first 100 northern pikeminnow caught under the new rewards system, anglers will receive $5 up from $4. Any further fish caught, up to 400, will now net anglers $6 a fish, also up a dollar. With catches of more than 400 predators, the reward now jumps from the previous $6 to $8. The Northern Pikeminnow Management Program is part of the Northwest Power Planning Council's Fish and Wildlife Program. It is funded by BPA and comanaged with the Pacific States Marine Fisheries Commission, Washington Department of Fish and Wildlife, Oregon Department of Fish and Wildlife, and the Yakama Nation. For information about fishing rules, registration, and sites call the Washington Department of Fish and Wildlife's Sport Reward Hotline at (800) 858-9015.